With the help of the great scholar and abbot, Shantarakshita, King Trisong Detsen had begun the construction of the first monastery, Samye, but had met with serious resistance from the non -human forces native to Tibet. He also had further opposition from ministers within his own court, who were hostile towards the introduction of Buddhism. 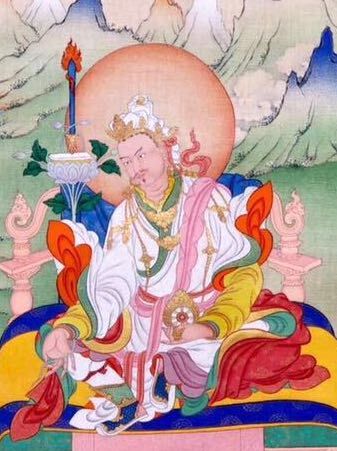 At Shantarakshita’s insistence, the king invited the great Indian Vajrayana master, Guru Padmasambhava, who bound all human and non-human obstructers to the service of the Dharma. King Trisong Detsen was then able to complete Samye Monastery within five years, without further difficulty. The king filled Samye with representations of enlightened body speech and mind, and it soon became the hub of Dharma activity in Tibet. With the assistance of Guru Padmasambhava, Abbot Shantarakshita, translator-adepts Vairotsana and Vimalamitra and many other scholars and translators, the king was able to ensure that his aspiration of bringing the entirety of the Buddhist teachings to Tibet was fulfilled. At Samye Chimbhu, Guru Rinpoche conferred the empowerments of The Eight Sadhana Teachings on his main disciples: the king and the twenty-five subjects (some presentations of the twenty-five disciples of Guru Padmasambhava include the king. Others, as here, refer to them as the ‘king and the twenty-five subjects’). His flower having landed on the mandala of Chechok (Vajramaha Heruka), the king practised this yidam and gained great accomplishment. He also received Dzogchen transmissions from Guru Rinpoche, Vimalamitra and Vairochana, becoming one of their primary disciples. King Trisong Detsen passed away at the age of sixty-nine. His rebirths included Sangye Lama (1000-1080? ), Nyang Nyinma Öser (1124-1192, Guru Chowang (1212-1270, Orgyen Lingpa (1329-1360), 5th Dalai Lama (1617-1682), Jigme Lingpa (1730-1798) and Khyentse Wangpo (1820-1892). The king had three sons and two daughters (although the number of his children and their names varies slightly between accounts). Of the sons, the eldest was Mu-ne Tsepo, in the middle was Murup (or Murum) Tsepo, and the youngest was Mutik (or Mutri) Tsepo. All three became disciples of Guru Rinpoche and received empowerment and instruction from him. At the age of forty-seven, Mu-ne Tsepo succeeded his father on throne, but only for two years, during which he tried to distribute wealth equally amongst rich and poor three times. At his death, his youngest brother, Prince Mutik Tsepo, became the thirty-ninth ruler of Tibet. After having received initiation and instruction from Guru Padmasambhava, he became highly accomplished. He was the reigning monarch at the time of Padmasambhava’s departure from Tibet. Murup Tsepo received many teachings and empowerments from Padmasambhava and others and became a great scholar and adept. Guru Rinpoche entrusted him with the Lama Gongdü cycle. King Trisong Detsen’s daughter, Princess Pemasal died age of eight. Because she was destined to be a holder of the Khandro Nyingthig teachings, Guru Padmasambhava revived her consciousness just long enough to entrust her with this transmission. Giving her the secret name Pema Ledreltsal, Padmasambhava allowed her to pass away. After many incarnations she was reborn as the tertön Pema Ledreltsal (1291-1319? ), who revealed the Khandro Nyingthig. Her next tulku was the omniscient master, Longchen Rabjam (1308-1363). In brief, King Trisong Detsen received complete transmissions of the profound teachings from three masters who were mainstays of the Dzogchen tradition: Vimalamitra, Guru Rinpoche, and Vairotsana. During this time of intense translation and teaching of the Dharma, the king received every single transmission that these and other masters bestowed, becoming a primary custodian of the teachings. It is partly thanks to the pure motivation of the king to establish the Dharma in Tibet, that for more than a thousand years, countless people have benefitted and achieved accomplishment through the study, contemplation and practice of the teachings. This lasting legacy of his benevolence and patronage continues right up to the present day, both within Tibet itself and stretching to the furthest corners of the world.